One of my favourite books of the year so far (and if you want to see my top books and possibly win a selection of them, then head here) is without question Kate Mayfield’s debut novel The Parentations. Now I mention getting nervous about books quite a lot, like I am constantly having to smell salts in my library which is not the case, but the size (500 pages) and premise of this book (immortality) did originally give me pause for thought. Yet I was swiftly enveloped in this novel and reminded that there can be nothing more rewarding than a big chunky book with an incredible tale to tell, and this is quite the tale indeed. They aren’t even sure he’s still alive. They’d tossed around ideas about him so often and for so many years that they’d created a shared fantasy about the kind of man he might have become. He might still be a boy, they reasoned. They considered, too, that he might be dead. They have no way of knowing. The Parentations starts in 2015 as the Lawless sisters wait for three things. The first is the day that they can go and look for a boy who they see as a son, in a designated place they return to each year not knowing if he is still alive but always hoping. The second is for a regular sleep that each of them takes for a long time while the other watches over. The third is a delivery of some kind of medicine. We then flit across London to the Fowler household where a similar shipment is due to arrive and where some members of the house are also trying to find a secret stash of it they believe has been hidden. To find out what links these two households and why they are awaiting this tincture we must head back several hundred years to a volcanic eruption in Iceland that reveals a pool of immortality. Now initially I admit I was a little bit ‘riiiiiiiiiiiiiiiiiiiight then’ however we are soon completely with Stefan in 1783 as this volcanic eruption takes over the island and how once having stumbled across this pool he soon becomes a guardian of sorts for it. Over a few hundred years (which Mayfield deftly and swiftly moves us through) more people drink from the pool who create a secret community. These include a couple who have a child with special gifts, who needs to be sent away and hidden as it seems their immortal secret has been discovered by those who wish to use it for harm. This is how we end up back in London in the early 1800’s and from here the story, which has already been brimming, takes its full gothic turn and force as we join the lives of the Fowlers and Lawless sisters and see how their lives become entwined. I will say no more on the plot because I wouldn’t want to spoil the twists, turns and delicious romp you have ahead. At nine o’clock no movement is detected. A group of women have come forward. They have paid a large sum to test the miracles of the gallows. One woman bares her breasts. The hand of a hanged man is believed to cure tumours. She mounts the scaffold. She has no fear, no hesitation, as she takes Finn’s hand in hers. Just as she raises it to her breast, his head rolls and his eyes open and meet hers. The woman faints clean away. If you love all things gothic then you will adore this book, especially if you like your gothic Victorian, and who doesn’t? Mayfield takes us through the darker parts of the societies and streets of London from orphanages to grand houses, from prisons to the gallows and everything in between. We have dramatic deaths, murders, saucy shenanigans of all sorts all with that ‘sensationalist’ pace and plotting that the likes of Wilkie Collins revelled in so much. You know Mayfield is having a huge amount of fun as she writes this and it’s an utter pleasure to be along for the ride, she also builds this dark and brooding London fully to life, in all its shadowy layers. What you also have is Clovis Fowler, who is one of my new favourite wicked women of fiction. I will just give you a little glimpse of how her husband sees her below, just to whet your appetite, she could almost give Mrs Danvers of Lydia Gwilt a run for their money. Clovis waits for a response, but he eats and drinks and grows weary – weary of her. His wife’s beauty no longer interests him. There is no gown, no simple or complicated design that is capable of dimming her voluptuous body, yet he no longer has the addiction he once did for her. In this, most men would think him quite mad, or a sodomite, but a man, especially a man like Finn, does not like to be used, and the feeling in his tackle goes limp whenever he thinks of her trickery. So he dines in silence. Yet amongst all this romp and sensation there is some incredibly moving moments and thoughts subjects The Parentations. The immortality which I initially felt a bit ‘riiiiiiiiiiiiiiiiiiiight then’ about goes from being the best thing you could wish for to the ultimate curse. How do you have to look after yourself if you have to try and live forever? What situations must you avoid? How do you cope as some of those around you that you live age and die? How must it be to want to die and be unable? The other particularly poignant strand of the novel is how we see society and culture progress and change over the years and how some of the characters we come to love, but might not live to see these changes, would benefit from them. I found that incredibly emotive. Again, this shows the brilliance of Mayfield’s writing. Her characters are wonderful, even the ones you are meant to hate (yes, the fabulous Clovis) and come fully formed with all their complexities and how they change in the subtlest of ways along with the times – another interesting element of the book – and as they try to survive what life throws at them. Mayfield also writes the shifting of these time periods and the atmosphere and changes in London as it moves towards 2015, without hitting you over the head with changes in technology, décor, etc she fully evokes exactly whichever decade you are in. The room is dripping in tat. A frayed lampshade sends a sickly, yellow glow into a grey corner that rivals the afternoon’s clouds. Puckering across the single bed a dingy, blue blanket fails to disguise the lumpy mattress. A weathered, Lusty chair, meant for a garden and cocktails, sits beside a small, unused Victorian fireplace in this rented room in Pimlico. It’s noisy, a bit smelly, and a hidden paradise. Kay Starr sings from a beaten up portable gramophone, two men stand entwined in a small moon-shaped space in the centre of the room. To dance naked is unbearably exciting. Jonesy lets David take the lead. 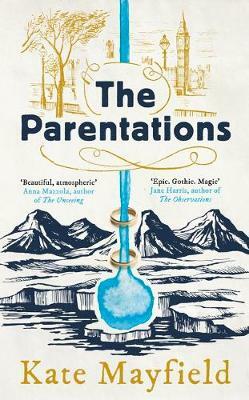 As I said earlier The Parentations was an instant hit with me, hence being one of my books of the year so far. I have no doubt that it will be one of my books of the year full stop as ever since I closed the final page these characters and their stories have held a place in my heart which continues to grow. Go and get your hands on it. Right now. What I admire about you when it comes to reviewing, Simon, is your generosity of spirit, your kindness and positivity. There is no book too weird that you do not find something positive to say about it. I can’t remember ever reading a review of yours where you have totally ripped into a book. The extracts above show someone who can write cleverly but you haven’t convinced me with this review. I read your comments, watched your video about your favourite books, and thought, at least of this one, nah….life’s too short. Oh that’s a shame as it’s an absolute treat of a book. It gives so much. But not everyone is going to love or be drawn to everything and I get that. Also I have sooooo ripped into some books in my time. Fear, The Martian and I think at one point a Trollope. Haha – thanks to you, I am currently reading it! Very intriguing as it’s not my usual sort of book but so far, so good. Looking forward to really getting into it. So – thanks again! Edit: Up to P150 – LOVING it! !